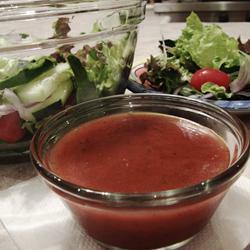 Spiced up with garlic, horseradish and paprika, this sweet, tomato-touched vinaigrette is perfect on almost any salad. Dissolve spices in broth, vinegar and lemon juice. Mix well and heat slightly in small saucepan. Chill and serve over mixed greens or vegetables.